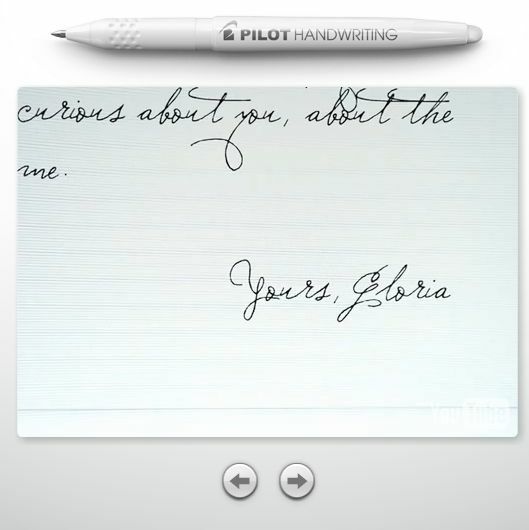 There aren’t many campaigns worth adoring, but we love, love the Pilot pen handwriting microsite which, as you can guess, allows you to scan in your own handwriting and then use it via computer to type documents or emails with informal penmanship. At first glance the system is a little gimmick designed to attract attention to old-fashioned (and perhaps classier) handwritten notes. But think of the risk. What happens to Pilot if we all opt-in, create our own computer fonts, and send messages to each other without buying pens and ink cartridges? Did Pilot just kill its future business? This campaign is an example of meeting your customers’ “enhanced need set” — a concept from Don Peppers and Martha Rogers that means thinking of concentric circles around your core product, and then brainstorming the additional needs your customers might like filled. Mobil gas stations did this with their clean bathroom and Speedpass campaigns (moms want sanitation, drivers want to get in-and-out fast). Westin hotels did the same with its “heavenly beds,” a luxury mattress that made sleeping nicer and was copied by much of the hotel industry. If you sell A, what happens if you also meet customer need B as well? For Pilot, we think the computer font move is brilliant, because the focus on handwriting likely outweighs the risk we’ll only type at each other. Just look at the Gloria signature above. Then think back to the days of fluffy white stationery with the little paper fibers embedded, bending beneath the scratch of your pen, with no delete key and only emotion to guide you. Don’t you feel guilty for writing home via email now? Integrated marketing is a simple idea but hard to pull off. Westin gets it right by catching us with train car cards and a full-page ad in Esquire at the same time. 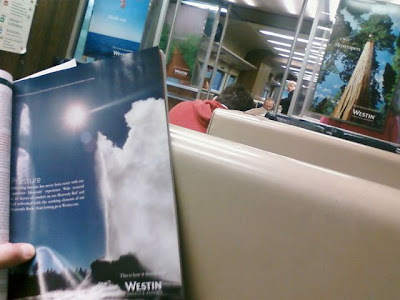 We’re busy business people, and in that flash of connection as we read and relaxed on the train out of NYC we realized a night at Westin sounds pretty damn good. The sweet cognitive resonance of advertising when it works! But alas, Westin, your Starwood Preferred Guest loyalty points program needs SERIOUS work though. Tell your local hotel managers to stop tacking on those hidden surcharges, as in that mysterious $59 that hits our AmEx even though the entire room is supposed to be free. We think you know what we’re talking about. Still, we dig that heavenly bed. Let’s meet at the Stamford bar and hash it out.